Over 60,000 radars have been purchased by players, field owners, retailers and tour officials. The Paintball RADARchron® is a small, affordable microwave Doppler radar velocity sensor that measures the speed of a paintball as it is shot from the marker. The purpose of the Paintball RADARchron® is to assess the speed of propelled paintballs relative to prescribed safety limits. The device is easily held by hand close to the marker barrel, or it can be attached to the barrel with a simple loop strap. Its one-button operation is simple to use. This innovative design results in a small, versatile low-cost velocity sensor affordable for all players, game officials, and field owners. Over 55,000 have been sold since its introduction in 2001. The Paintball RADARchron® has proven to be so successful that many tournaments have written its use into their official rules. Its innovative design allows game officials to conveniently measure speeds before, after, and during competition. The Paintball RADARchron® is microprocessor controlled, like a mini-computer, and indicates calculated feet-per-second paintball speed on a two-segment liquid crystal display. 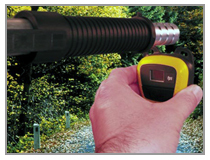 The range of speed measurements is 150 to 450 feet per second, within ± 2 % accuracy. The Paintball RADARchron® is packaged in a rugged plastic housing, sealed to protect the internal electronics from dust, dirt and moisture encountered during normal use. It is triangular in shape, 2 1/2” wide, 3 1/2” long, and 1 3/16″ thick, weighing less than three ounces. A three-volt, 160 milliampere-hour Lithium battery powers the electronics. This small N/3 size battery provides approximately 30 hours of operating life, representing over 3600 speed measurements. The Paintball RADARchron® transmission level is well below that of most “wireless” consumer products such as cellular and portable telephones, for example. Transmission characteristics are well within FCC, CA, and CE requirements and prescribed safety levels. The Paintball RADARchron® is affordably priced at $79.95.